One of the sisters I visit teach gave me a Heater in a Can as a gift. Thank you! I love it so much that I am going to post how to make one here. I am sure we’ll have a group buy for this and activity to put it together in 2009, but for now I am just putting the instructions on the site so we don’t forget. Enjoy! Heater in Car during winter months. Heater for your 72 hour kit. pack of matches or lighter. To make as a gift: Remove core of toilet paper. 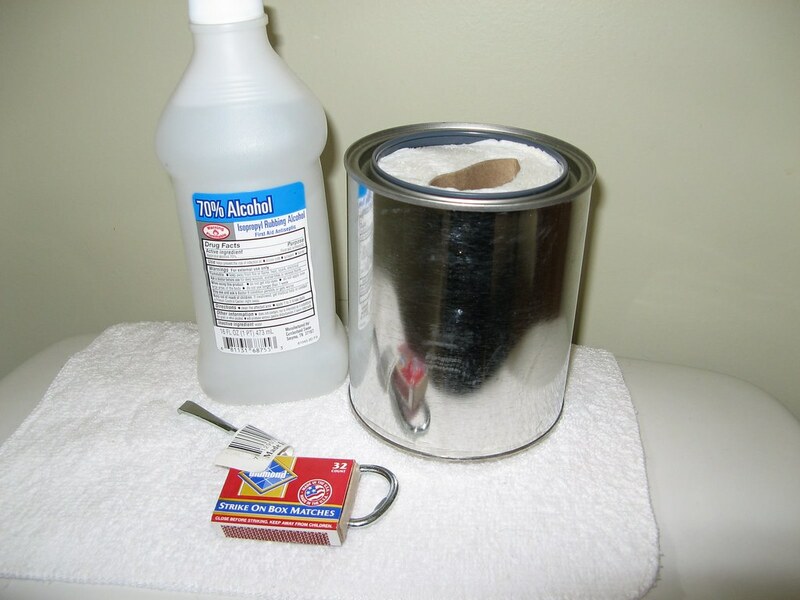 Fold the roll of toilet paper in half and stuff into the empty quart can. Put the can and the rest of the items in a ziploc bag separately so the recipient may pour the alcohol in the can when heat is needed. Copy the text below and include it with the kit. Fold the roll of toilet paper in half and stuff into the empty quart can. Slowly pour 1 pint alcohol into can. Light w/ lighter or match. To extinguish, replace the lid. Put the following instructions in with the rest of the items. Use 70% isopropyl alcohol-any higher percent the flames could be too high. Do not use scented alcohol, it will smell awful in your car. 4 pints of isopropyl will keep a car 60 to 70 degrees for 24 hours. They are extremely safe and don’t produce carbon monoxide. Warnings: Be careful the can rim will be hot to touch during and for a while after burning, although the can could be held from the bottom even while the heater is burning. It is suggested that you carry a metal pan or cookie sheet or fold a square of tin foil into fourths to set the heater on. Do not pour more alcohol on the heater while burning. Wait for it to burn out or smother with metal lid. This heater is NOT recommended for cooking! HEAT: Have battery & solar operated fans, spray bottles, sunglasses, hats & sunscreen. COLD: Have gloves, hats, coats, boots, & scarves. RAIN: Have waterproof ponchos & waterproof boots, with extra clothing.